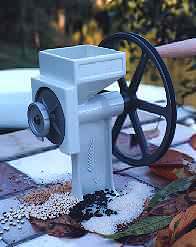 Anybody even slightly interested in self sufficiency, survivalist skills, or just good nutritious food at a low cost will find the Country Living Grain Mill without peer. 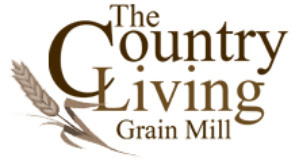 In fact, when comparing the finely engineered Country Living Grain Mill (the only mill with a 20 year warranty) with all the other grain mills on the market (hand OR electric), the Country Living Grain Mill is the only one that really makes sense. Solid I-beam construction from cast aircraft aluminum, double industrial sealed bearings, stainless steel shaft, and carbon steel grinding plates come together to make a rugged and durable mill, which Country Living backs with a lifetime warranty. It will grind virtually all dry grains and legumes, including wheat, corn, beans, peas, amaranth, etc. It is designed to be quickly and simply motorized. The industrial quality and ease of use is what sets this mill apart from other hand mills. Double-sealed industrial armored ball bearings and its hand-cast solid aluminum body give it the strength to last many lifetimes. The Country Living Mill is without a doubt the most rugged manual grinder on the market today. It is the only grinder, of which I am aware, that utilizes two industrial-grade ball-bearings. Other comparable grinders that cost around $200.00 more than the Country Living mill use brass bushings. Many grinders use only one large bushing, but the Country Living Mill has two sealed ball bearings spaced apart* which increases the stability of the drive shaft and reduces bearing strain. *The bearing placement can be seen highlighted in red on the diagram to the left. 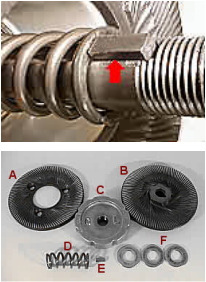 The photo to the right shows what the grinder looks like when the threaded adjustment knob, the rotating burr, the drive key and grain auger have been removed. The grinder must be broken down to this point to install the bean and corn auger. If you wished, you could now pull the drive shaft out of the mill from the crank side. You can see that this grinder is amazingly easy to take apart and clean. If you are using the large auger, there are three keys that must be installed for the grinder to operate. The standard auger set-up only requires two keys. The purpose of the keys are to lock the different rotating parts of the grinder to the drive shaft so they all turn as one unit. There's a key locking the pulley wheel to the drive shaft, another to lock the bean and corn auger to the drive shaft, and on the end of the grinder a third key to lock the rotating burr of the grinder to the The Key...drive shaft. The keys are quite small and are easily lost. When taking the grinder apart, be mindful of the keys. Before any disassembly, clean your work area. More than one key has been lost in a bowl of wheat or flour. This is especially true for those who do not know to keep an 'eye out', as the key can quite unnoticeably fall out of the groove in the drive shaft during disassembly, then get lost in whatever floury mess you have at the base of the grinder. For many folks, the first indication there's something wrong is when they reassemble their grinder, and the rotating burr doesn't turn when they crank the handle. By this time, the key may very well be long gone. Be careful with the keys. The grinder won't work without them.